Painting by William Barnes Wollen of the Battle on Lexington Green. The early months of 1775 were a period of great anxiety in Massachusetts. The city ofBoston housed a large contingent of British soldiers who nursed shared antipathy with an increasingly sullen populace. Insults and fights between the two sides were commonplace. The tension was heightened by economic dislocation. The port of Boston had been closed in retaliation for the earlier Tea Party and traditional forms of self-government had been replaced by royal authority. Many of the Patriot leaders feared arrest and had left the city for the comparative safety of smaller communities in the countryside. The British were to find that 1775 was to be a disastrous year. They did not appreciate the scale and difficulty of the military task facing them in America until too late, and they allowed the bulk of their forces to become bogged down in an exposed base while the British positon collapsed throughout much of Northern America. By the end of the year the British government faced the possibilities that it would lose Canada as well as the Thirteen Colonies. In the afternoon of the 18th (April, 1775) the patriots in Boston watched every movement of the troops with keen vision. Dr. Warren, Paul Revere and others made arrangements for a sudden emergency, to warn Hancock and Adams of danger, and to arouse the country. Their precautions were timely, for at ten o&apos;clock that evening, eight hundred British troops marched silently to the foot of the Common, where they embarked in boats and passed over to Cambridge. They were commanded by Lieutenant-Colonel Smith, assisted by Major Pitcairn. Gage supposed his secret was inviolate, but was soon undeceived. In February, the British Parliament declared the colony of Massachusetts to be in open rebellion and authorized British troops to kill the violent rebels. They were ordered to destroy all of the stores that had ammunition, rifles, or other arms. Lt. Gen. Thomas Gage, the commander-in-chief of the British Army in America, was given command to quell the rebellion. He gave the orders to the British troops to destroy stores and rebels. Massachusetts Colony was a hotbed of sedition in the spring of 1775. 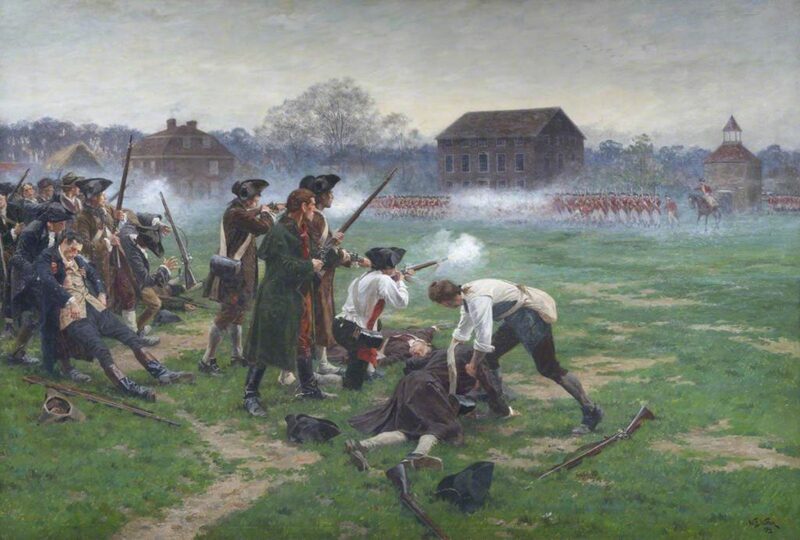 Preparations for conflict with the Royal authority had been underway throughout the winter with the production of arms and munitions, the training of militia (including the minutemen), and the organization of defenses. In April, General Thomas Gage, military governor of Massachusetts decided to counter these moves by sending a force out of Boston to confiscate weapons stored in the village of Concord and capture patriot leaders Samuel Adams and John Hancock reported to be staying in the village of Lexington. On the 15 of April 1775, when General Thomas Gage, British Military Governor of Massachusetts, was ordered to destroy the rebel&apos;s military stores at Concord. To accomplish this he assembled the "Flanking units", including Light Infantry and Grenadiers, from his Boston Garrison. In charge he put Lieutenant Colonel Francis Smith and Marine Major John Pitcairn. He also composed a relief column under the command of Lord Hugh Percy to leave 6 hours after the main column. In an attempt at secrecy he did not tell his officers his plan until the last minute. The problem with his security measures were that Boston had become a glass fishbowl. All rebel eyes were watching to see the British&apos; next action, and when the garrison committed to an action, the Americans knew their every move. As a response to hearing the hearsay of possible revolts from the rebels in the areas surrounding Boston, Major General Thomas Gage, the commander of all British forces in North America, who is stationed at Boston, orders a column of seven hundred men to demolish the weaponry depot at Concord. The column is under the command of Lt. Colonel Francis Smith, and his second, Major John Pitcairn. It is Pitcairn, who we well see, is in command of the front forces in Lexington. Lexington and Concord, battles of, opening engagements of the American Revolution, Apr. 19, 1775. After the passage (1774) of the Intolerable Acts by the British Parliament, unrest in the colonies increased. The British commander at Boston, Gen. Thomas Gage, sought to avoid armed rebellion by sending a column of royal infantry from Boston to capture colonial military stores at Concord. Britain&apos;s General Gage had a secret plan. During the wee hours of April 19, 1775, he would send out regiments of British soldiers quartered in Boston. Their destinations were LEXINGTON, where they would capture Colonial leaders Sam Adams and John Hancock, then CONCORD, where they would seize gunpowder. But spies and friends of the Americans leaked word of Gage&apos;s plan. The Battle of Lexington and Concord took place on April 19th, 1775 and were the first battles of the American Revolutionary War. The winter of 1774-75 was mild for New England, however the affairs of men met no tempering influences. The Committee of Safety set up by the Provincial Congress of Massachusetts (it was given the power to call out the entire militia of the colony), voted that "all kinds of warlike stores be purchased sufficient for an army of 15,000 men," and selected the village of Concord as a suitable depot, far from the reach of British Major General Thomas Gage&apos;s raids. General Thomas Gage, an amiable English gentleman with an American-born wife, commanded the garrison at Boston, where political activity had almost wholly replaced trade. Gage&apos;s main duty in the colonies had been to enforce the Coercive Acts. When news reached him that the Massachusetts colonists were collecting powder and military stores at the town of Concord, 32 kilometers away, Gage sent a strong detail from the garrison to confiscate these munitions. In the early spring of 1775, General Gage had between 3,000 and 4,000 troops in Boston, and felt strong in the presence of rebellious utterances that filled the air. He observed with concern the gathering of munitions of war by the colonists. Informed that a considerable quantity had been deposited at Concord, a village about 16 miles from Boston, he planned a secret expedition to seize or destroy them. Towards midnight, on April 18, he sent 800 men, under Lieutenant-Colonel Smith and Major Pitcairn, to execute his designs. At sunrise on the Lexington Green the first shots exact a down payment in blood for the priceless gift of freedom&apos;s ring and the American Revolution began in earnest.